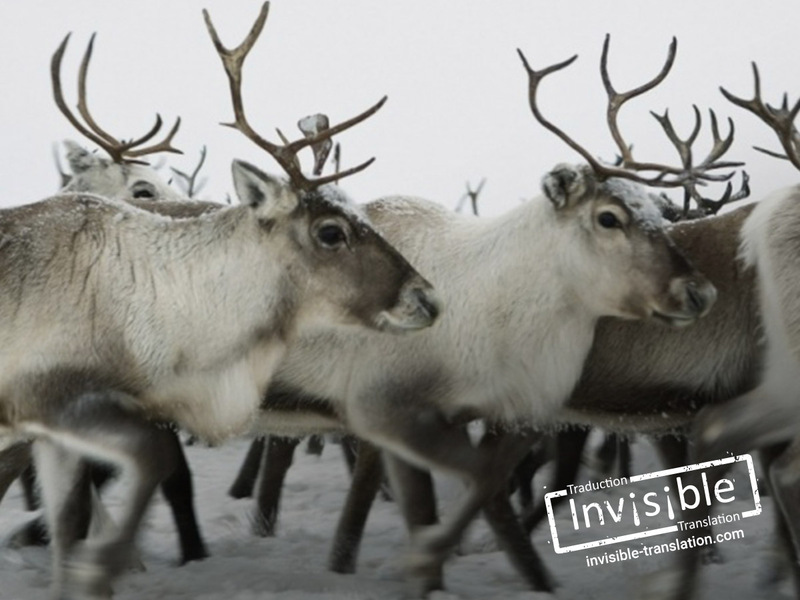 You say “reindeer” and we say “caribou” | INVISIBLE Translation Inc.
Santa Claus will soon begin his race around the globe, and Quebecers who love reindeer are chomping at the bit: perhaps this year they will get to see a reindeer glide across the sky (or through the snowy fields) of their great northern land. The holiday season is a truly magical time, and the perfect occasion to use the word “reindeer” to describe the ruminant mammals that faithfully accompany the jolly bearded man as he delivers all his presents. Throughout the remainder of the year, residents of our “Belle Province” are content to track “caribou” during the hunting season. If they return empty-handed, they often warm their bones with a few sips of the traditional alcoholic beverage that bears the same name as this animal. Caribou: Canada’s version of reindeer? If your little one has not yet asked you to explain the difference between a “reindeer” and a “caribou,” it is just a matter of time. Since we all like to impress our children, you should be aware that Quebec’s caribou and Europe’s reindeer both belong to the same family: that of the Rangifer tarandus. In fact, European reindeer are just one of the many ecotypes in this animal category. According to Le grand dictionnaire terminologique, there are three subspecies of caribou in Canada: woodland caribou, Peary caribou and barren-ground caribou. Another subspecies, the Dawson caribou that once roamed Graham Island, is now extinct. Why does Europe opt for the word “reindeer” while Canada uses “caribou” to describe the same mammal? According to the Centre national de ressources textuelles et lexicales, the term “reindeer” (reen in Swedish) came into use in France around 1678. The term “caribou” made its appearance in Canada around 1609. It is a derivative of kálibu, from the Mi’kmaq dialect. Since how we express ourselves varies based on geographical, historical, cultural and social contexts, these two distinct linguistic realities gave birth to two different words. Trying to describe the winter conditions of our country verbally or in writing aptly illustrates this paradox. As temperatures rarely drop below -5 °C in January in the City of Lights, Parisians can understandably be at a loss for words to describe the glacial cold of a bitter night in Quebec, where a tuque (hat) and mitaines (mitts) are required. Of course, no one needs a “snowmobile” when there are no “snow banks” or “powder”! And who needs “caribou” when you already have “reindeer”? Language is a communication tool that is shaped by social and cultural realities, and that is a wonderful thing! But if a Frenchman invites a Quebecer to go reindeer hunting, or if a Quebecer offers a swig of caribou to someone from France, both speakers will stir up a real blizzard of misunderstanding. To capture the vast portion of the Francophone market in North America, as represented primarily by Quebec, retain the services of a local language professional who knows how to take advantage of linguistic subtleties to help your written communications reach their target.